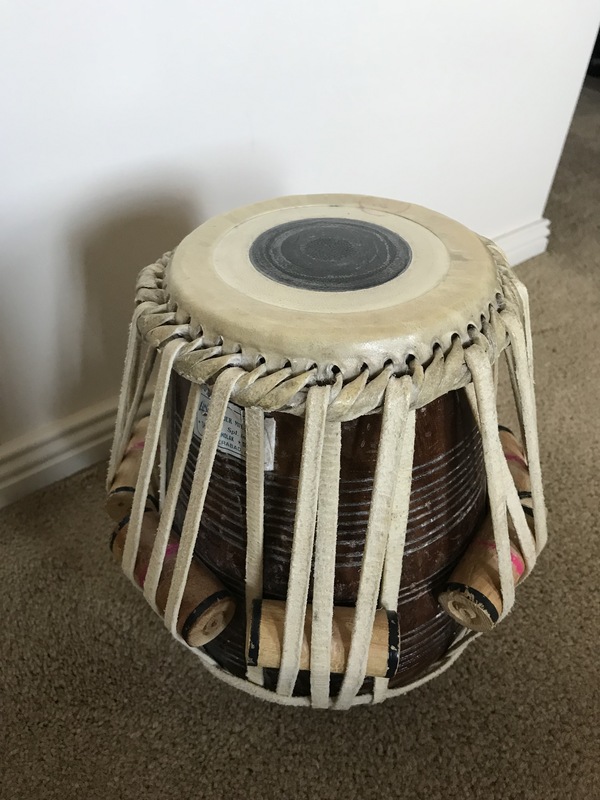 Deviating from the usual themes of gharana, composition and practice – I thought I would write a bit about the various types of tabla I have, how I came to own them, and a bit about the characteristics of different tabla makers. First off, it’s probably worth pointing out that sourcing a good set of tabla is a difficult task. 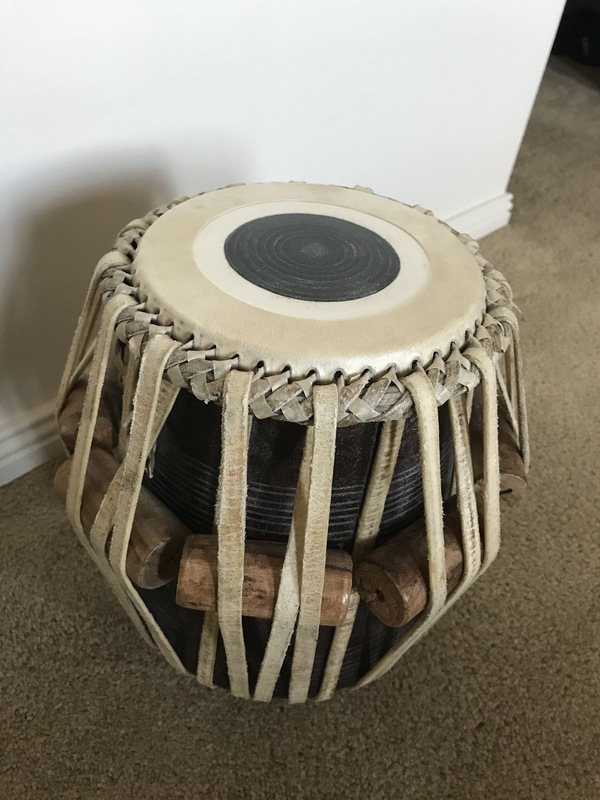 There are a number of different makers in all of the various cities of India – finding which ones are good, being able to source a quality instrument from them, not getting ripped off; and then finding a tabla that sounds good, looks good, and stays in tune – these are all the challenges a tabla player faces. Particularly for those living outside India. Although the “style” of tabla (e.g. Bombay vs Calcutta) seems to boil down mainly to a matter of personal preference and habit, there is no doubt that sourcing an instrument from one of the top tabla makers is highly recommended if at all possible. It takes some effort to work out who the good makers are, and even then one is not necessarily guaranteed a good instrument – there is a risk of getting ripped off especially if you are a beginner, from abroad, or both. An introduction by one’s teacher, fellow student or fellow tabla player is usually the best approach. Calcutta / Kolkata has produced some of the most outstanding tabla players of the current generation (Anindo Chatterjee, Swapan Chaudhari and many others) and also happens to produce extremely high quality tabla – known for thinner skins and a sweeter sound than Mumbai drums (more on this below). The three makers listed above are the ones I know of that have the best reputation. I have personally been to Shyamal Das’s shop on Rakhal Das Auddy Road and have sourced a number of my drums from him. Shyamal was a very quiet, dignified man who struck me as being the quintessential master craftsman more interested in creating a quality product than in producing for the mass market to make money. I don’t have direct experience of Mukta Das’s drums but he’s probably the most popular of the Kolkata makers today – I’ve seen his drums used by several big name tabla players, most notably Swapan Chaudhari. A couple of big name tabla players use Badya Niketan’s drums (most notably Subhankar Banerjee) and he seems to have a reputation for making good bayans in particular. Beyond that I don’t have much knowledge of or first-hand experience of Badya Niketan. In general, my impression is that the Calcutta makers are fine craftsmen who generally make a quality product. The drums sound great but are reputed to not be as durable as the Mumbai drums – this is the only downside. I feel like I am missing a couple of names from this list, however these are the makers that come to mind when thinking of Mumbai / Pune. Haridas Vhatkar is arguably the most famous tabla maker in the world due to his patronage for nearly half a century by the great Ustad Zakir Hussain, and Ustad Allah Rakha before that. Even Pandit Anindo Chatterjee, despite being from Calcutta, was using Haridas Vhaktar made tabla for a long time. While I have no direct experience of Haridas Vhatkar drums, their reputation precedes them. Clarity of tone, durability, tunefulness (staying consitently and evenly in tune is one of the hallmarks of a well-made tabla, and one of the reasons to buy from a good maker) are all top notch. They are expensive though and there is a long waiting list to get one. Vishnu Sutar seems to be a hidden gem among the tabla craftsmen of Maharashtra. While not as famous a name as Haridas Vhatkar, I’ve heard rave reviews of his drums from friends who’ve played them, and at least one well-known Mumbai tabla player (Aneesh Pradhan) uses his drums exclusively. Somnath Kakade is a young and upcoming tabla maker based in Pune who has created a very good name for himself in just a few years. I have personally bought drums and skins from Somnath on a few occasions (for myself as a well as friends and students) and I can recommend him highly. The quality and tone of his bayan (and bayan skins) is particularly noteworthy. After I played one of his bayans I immediately switched all my bayans to Somnath skins. His dayan are probably not quite as good as someone like Haridas Vhatkar’s but still of very high quality and much easier to get hold of. Somnath is also personally very easy to deal with. Pt Anindo Chatterjee and his son Anubrata Chatterjee are mostly playing Somnath Kakade made tabla these days. There is one famous tabla maker in Hyderabad known as Akbar Miya. He seems to have a good reputation, or did at one time at any rate, as the original Akbar Miya has long since passed away and the shop is now being run by his sons and grandsons. Although the quality of their instruments is known to be good, I don’t have immediate experience of playing them. I did try and procure a new skin for one of my dayans recently from Akbar Miya – however it was difficult to get them to ship it abroad. Although I was quite keen to try one of their skins, due to logistical difficulties I’ll probably end up sourcing one from Somnath instead, who is much easier to deal with in this respect. There are a number of quality tabla makers in Benares… however given that I’m not very familiar with the landscape there I won’t attempt to provide a list as I don’t think I will be able to do it justice. The only Benares tabla maker I have any experience with is Anwar tabla maker, who is the supplier for Tabla Wala online tabla store. One of the oft-repeated debates amongst tabla players is “what type of tabla is best?”. 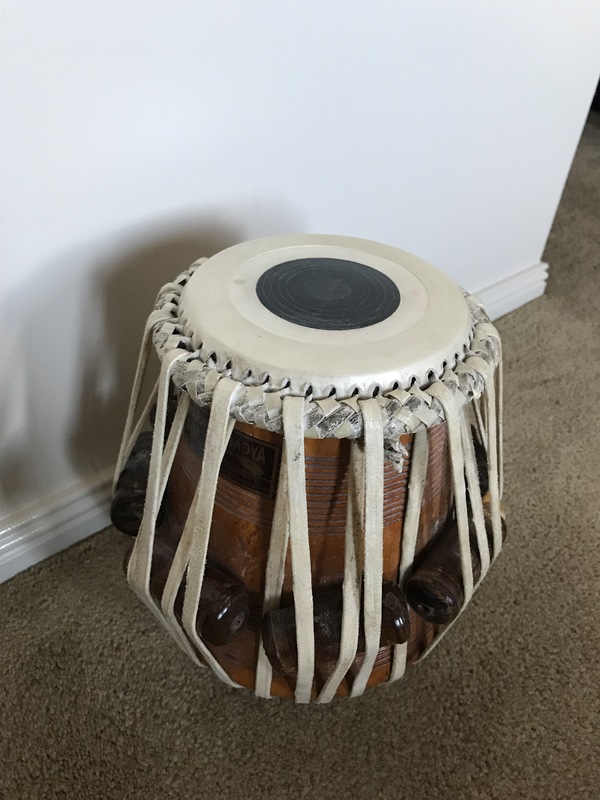 In my experience, as long as one has a good quality pair of drums from a quality maker, the style of tabla ultimately makes little difference. I think that really just boils down to personal preference, and whatever you are used to. Mumbai or Pune based tabla players tend to use the tabla from their region. Kolkata based players inevitably use Kolkata style tablas – I don’t think it really matters that much, at the end of the day. Calcutta tabla have a reputation for long sustain, a “sweet” sound and a “bell like” tone – all of which is true. There is a misconception though that, because they have thinner skins, Calcutta tablas are easier to play than Mumbai or Pune style tabla, as less effort is ostensibly required to make a sound. I have to say that I completely disagree with this view. 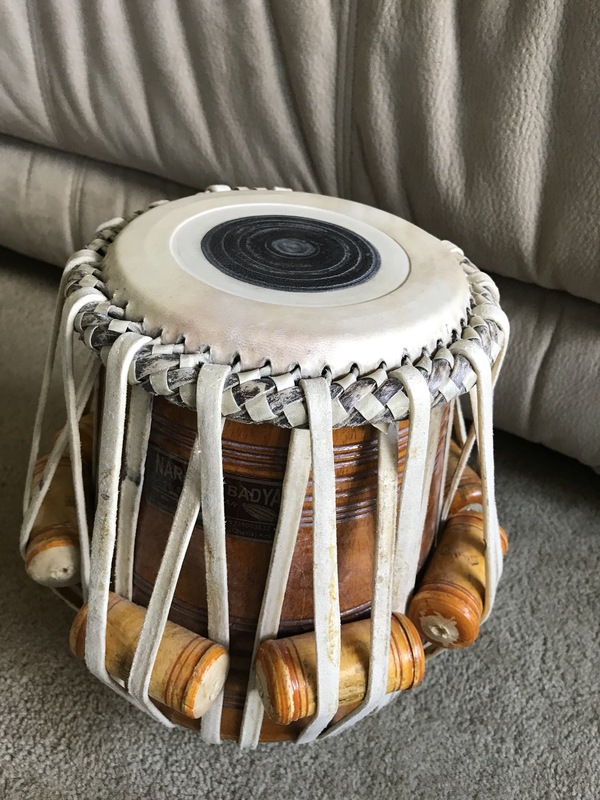 I have found that Calcutta tabla can in fact be harder to play than Mumbai tabla, for the following reason – because of the sweeter tone and the thinner skins, Calcutta tablas can be less forgiving. Even a minor devitation of finger placement can result in an “off” sound, whereas Mumbai drums are more forgiving in this regard. I personally feel that playing Calcutta style tablas ultimately requires an overall better technique based on my experience of having played both types. Mumbai style drums have thicker skins and, more importantly, a thicker syahi. Although it is true that a slightly harder hit is required to get a sound out of the “chanti” on a Mumbai drum, I don’t think it is really that significant. Also, because of the thicker syahi, I find it slightly easier to get thick and chunky sounding “Ti Te” and “Tirakita” strokes from Mumbai/Pune style skins. 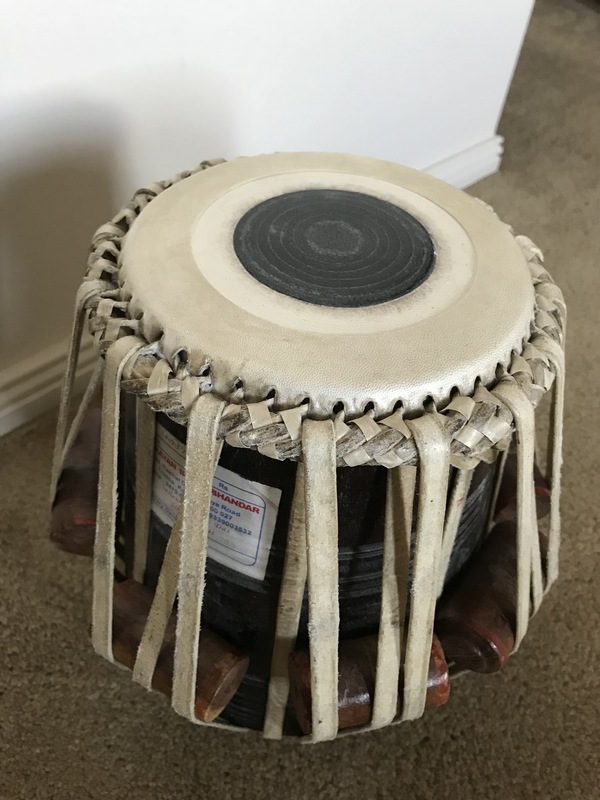 I find overall the Mumbai / Pune drums to be slightly more forgiving of bad technique, one can hit pretty much anywhere on the chanti and still get a good, full sound out of it – not so on on the Calcutta drums. Mumbai drums do have a reputation for being longer-lasting than Calcutta drums, and this is probably true. Delhi and Benares style tabla are mostly similar to the Mumbai style with thicker skins and thicker “gab” or “syahi”. Benares have quite thin bayan skins to aid sliding motions of the wrist which are common in Benares style of tabla playing. Benares dayans also tend to be highly resonant with a lot of sustain and a somewhat “piercing” tone. The style of drum one likes really just boils down to habit and personal preference at the end of the day. 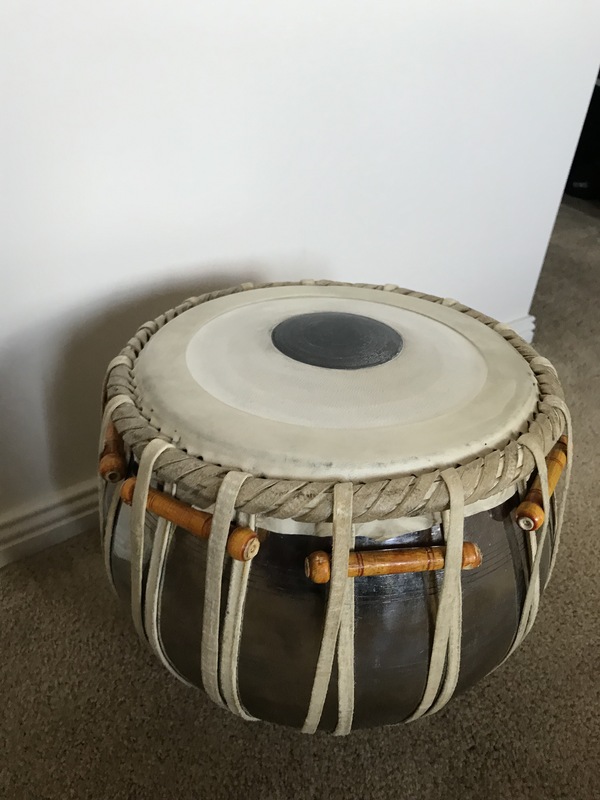 Although it is good to get a quality pair of drums if you can, ultimately, the type of tabla you have is much less important than the depth and intensity of your dedication and practice (“riyaaz”)! This is a 5 1/2 inch dayan from Shyamal Das in Calcutta. Beautiful mahogany wood and a classic Calcutta style skin. It has a beautiful high pitched tone with matchless sustain and a very pleasant tone. Currently tuned to D.
I do sometimes find that the tone of this drum can be a bit too “trebley”, which can be one of the downsides of a Calcutta style skin. Mumbai style heads tend to offer a more well rounded tone, which can be good particularly on smaller and higher pitched drums like this one. That said, this is a very lovely instrument with a beautiful tone. One of my two bayans. This one is currently my favourite and one of the best bayans I have ever played! The shell is a copper/brass alloy which I originally bought from Delhi around ten years ago. I have replaced the original skin with a skin from Somnath Kakade. Interestingly, although this bayan has a 9 1/4 inch diameter, the skin is slightly oversized at 9 1/2 inch. I’m not sure if that has anything to do with it, but either way, the tone and feel of this bayan is absolutely brilliant. Deep, soulful bass tone with great sustain and very responsive to modulation. This is one of my more recent acquisitions – I got it late last year from Shyamal Das. I had to wait for around 3 months to get it, but the wait was worth it. 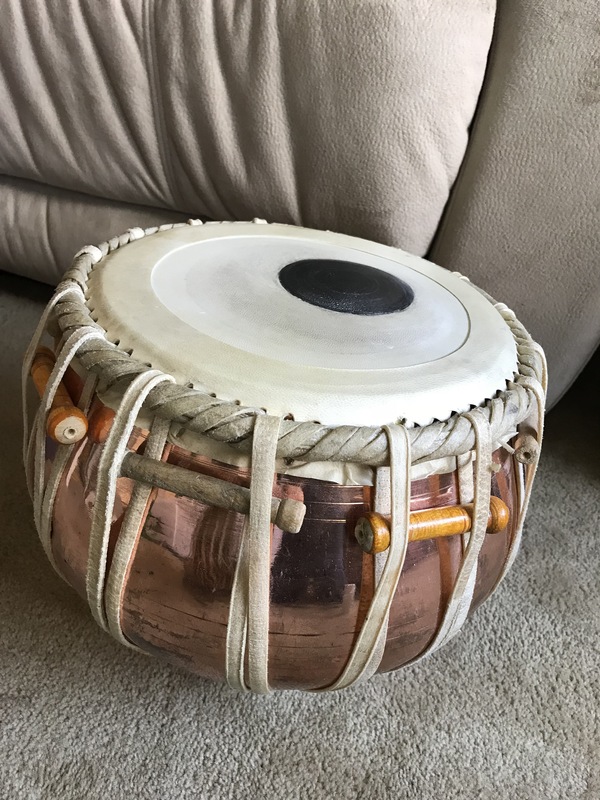 It is a slightly larger head (5 3/4″) tuned to C. I had specifically requested one for C pitch (to accompany sarod), as none of my other drums seemed to sound good in C.
Like my other drum from Shyamal this is also made of mahogany wood. The skin on this drum is interesting because both the “chanti” and the “gab” feel slightly thicker than I’m used to for Calcutta drums. It gives a nice, mature tone that is very well-balanced. Nice sustain without being too “trebley”. This is a recent acquisition of mine from someone selling an old pair on tabla from Gumtree. I was attracted to this tabla as soon as I picked it up – the woody is heavy and thick, which is something I like. The original maker was Akbar Miya from Hyderabad, based on the sticker on the shell, however the skin is a Benares skin (5 1/2″ dayan, tuned to C#). Although I was attracted to the sweet and high-pitched tone of this drum at first, after playing it for a while I found the tone of his drum to be a bit “hard edged”, compared to the relatively softer tone of the Calcutta drums I’m now used to. Given also that the syahi is starting to look a bit weathered, I’m probably going to replace the skin soon. This is one of the awesomest tablas in my collection. It has a larger size head (6+ inches) currently tuned to A# – this pitch is mainly used to accompany female vocals. Every serious tabla player should have at least one larger size tabla like this in their collection. The larger heads are very good to practice on to build hand strength, and the deeper tone is also a nice contrast to the smaller, high pitched drums that we usually hear. Pakhawaj bols like “TiTe Kata Gadi Gana” are very good to play on this drum. I originally bought this years ago from someone who had brought it from Mumbai. It has a very nice, sturdy and thick wooden shell. I had the original skin replaced by Shyamal Das when I visited Calcutta in December 2015. Beautiful drum with wonderful, deep and austere tone, that gives a hint of pakhawaj tone. An interesting drum (5 3/4″) with a tone that sounds gorgeous at times and at other times a bit “piercing” which can be a little off-putting. First of all this drum has the heaviest (by far) shell of any dayan I have ever seen! It is an immensely heavy shell of “pure shisham” wood. This type of wood is now no longer available in India as the tree is endangered and commercial sales have been banned. Unfortunately, due probably to a lack of care by the original maker, the drum’s shell is not perfectly circular, meaning that the skin will never sound quite “right” and will have trouble staying in tune. This too has had the original skin replaced by Shyamal Das. The skin is nice and thick for a Calcutta skin, however I wish the gab were a bit thicker – this drum has almost “too much” sustain, so much so that it rings in the ear a bit. There are times I really enjoy playing this drum though, as it has a unique tone and unique feel. I will probably get the skin replaced eventually, ideally by one of the Mumbai makers, as I think a Mumbai style skin would better suit this drum. And last but not least, the second of my two bayans. I bought it from Shyamal Das in December 2015, however I was never a fan of the original skin. There is something about the tone of Calcutta style bayans, they can sometimes sound a bit “shallow” compared to the Mumbai/Pune style bayans. I have replaced the skin with one from Somnath, which sounds much better. For some reason I’ve had trouble keeping this skin in tune evenly all around the drum, which is unusual as tuning is not normally a problem on bayans. This is a good bayan with a good sound, but I must say my other bayan sounds particularly good. This is now my “backup” bayan. It’s also slightly smaller than the other one, so if space is an issue I usually carry this. Hope you have enjoyed reading about the different types of tabla drums, the various makers and the overview of my personal collection. Excellent article, thx for sharing your tabla journey. Would like to discuss with you in more detail about Tabla and Tabla learning process in future, if possible drop your what’s app mobile number so we can be reached to each other. Will mail you as suggested. Thank you for all the information. I am a beginner and learning now. Please suggest the type of Tabla which I need to start with. I am looking to get one for me. Please suggest if there are any specification required to purchase pair of one. Hi Nilkanth. It is good to have a decent quality pair of tabla. However it depends on where you are located, how easy it is for you to find a good set, your budget etc. Regarding specifications, for beginners I suggest you start with a 5 1/2 inch size daya (right hand drum). For bayan it doesn’t really matter as long as it is a decent quality one, ideally it should be made of brass or copper and be at least 2kg in weight. Please email me for further information: shivabreathes at gmail dot com. If you let me know where you are located and your budget etc I might be able to advise you further.